There are always days when we carry heavy burdens and at times we feel like we are going to drop the load. BUT GOD, yes, two of my favorite most powerful words, But God wants you to drop the load and give it to him. Drop it at HIS feet. Drop it at the foot of the cross. Please know that He would rather carry it for you. Entering into this Passover week brings so many thoughts. So many things that Christ did when he died for us. He willingly wants to carry your burdens like he did His cross. He willingly took the crown on His head to give us the mental strength we need. He willingly took the 39 lashes that ripped His flesh apart so that we might have strength and healing to continue this journey here on Earth and more importantly to have life everlasting with our creator. I sat in church yesterday as our Pastor Chris Hodges described in details what the Lord went through for us. I know the story. I know Isaiah 53. There was a silence I have never heard before in the church. His words pierced our hearts. His words pierced my heart. Tears were falling down many cheeks. There was a fresh revealing of the scripture to me. REMEMBER what he did for my sin. Never grow accustom to this glorious account of history in the word. What kind of love is this? In Him we find a love that knows no bounds. He loved us in spite of all our sins. As the song goes, no greater love has any man ever known, no greater love has any man ever shown than this kind of love. The Cross tells us that Christ will never leave us alone to fend for ourselves. The Cross and His glorious resurrection tells us we have a LIVING SAVIOR. We can tap into his strength and he will enable us to do things for him we never thought we could. We can forget our weakness and rely on his strength . He won’t let us stumble or fall. We can go on~ With God’s perfect strength ~ to the end of this journey. Billy Graham was asked how did he run this race so well in this life? How did he continue this fight so well? HIs answer was , ” Live with the end in mind because the end is going to come.” Powerful ~ He learned early to focus on what matters. He focused on the race that the Lord has placed before him. The Cross is there to remind us that even though sometimes he shields us in ways that we don’t understand or expect, we must trust him. He loves us and he knows best for us. For we must meditate on his promise, The Lord is my strength and my shield, my heart trust in him, and I am helped. Psalms 28:7 and Cast your cares on the Lord and he will sustain you, He will never let the righteous fall. 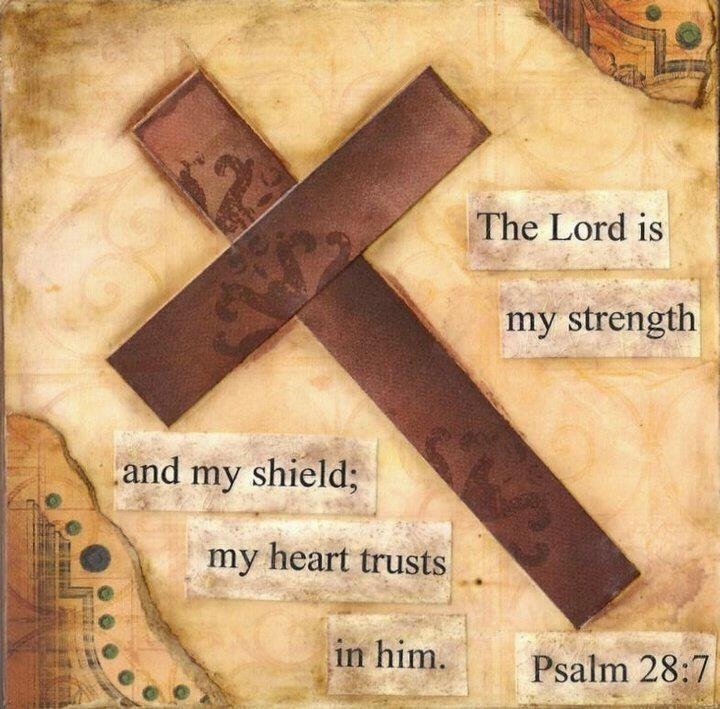 Psalms 55:22. This entry was posted in Believe, Bible, Biblical perspective, Christian, Christian Inspiration, Christianity, Church, Courage, Discipline, Endurance, Faith, Faithfulness, Forgiveness, Grace, Hope, Inspirational, Jesus, Mercy, Perseverence and tagged Cross, journey, peace, Redeemer, sacrifice, Savior, Strength. Bookmark the permalink.